A room is 30 feet long, 12 feet wide, and 12 feet high. An ant is one foot from the ceiling in the middle of the 12 foot long wall on the north end of the room. A drop of honey is in the middle of the 12 foot long wall on the south end of the room, one foot from the floor. How far does the ant have to walk to get the honey. Hint: if the obvious path were the shortest, I wouldn’t have bothered to post the problem. Honey drops to the floor. Ant is releasing from the wall and also falls to the floor. Now the little ant has only to walk 12 feet for getting that delicious honey. How? Pretty sure it’s a bit further than that, but love to hear how the ant does it? The ‘straight-line’ distance is 42. So we are looking for a way to ‘cut a corner’ somewhere to lessen the distance. Unrolling the walls into a plane we find a path that goes along the hypotenuse that takes the ant across three sides of the length from ceiling to floor. That way the bottom of the triangle is only 32 feet! The side is 6+6 from each side wall and an extra 12 from the length. So the total is sqrt(24*24+32*32) = 40. You forgot that the ant needs to travel two times 6 (center of the wall remember). So it would be 12+31.622776 = 43.622776. It’s walking, not flying across the room. It seems pretty straightforward: Unfold the room to create a plane, have the ant walk straight to the honey. Unfold at the northwest vertical and the southwest vertical (or the northeast and southeast). In other words, either the west wall or the east wall is the main part of the plane, unfold the north and south walls to lie in this same plane. The ant is now 10 vertical feet above the honey and 42 horizontal feet from the honey. The ant has to walk sqrt(42**2+10**2), which is roughly 43.2 feet. Funny they have this puzzle on their site I think. About 40.717 feet or is this beer stronger than I thought? 1ft up to the ceiling and 30 ft along the ceiling. Then drop the 11ft to the honey. 31ft walked using the original specification. The honey should be able to stop the ant as he drops. My girlfriend came up with 40 after I got 43.2 just like Peter did. That wild make it 31’… and that’s what I’ve came up with as my best stab at it — and this is only assuming that the ant is allowed to leave the surface and drop to the floor. No, not less than 23. You can flatten the walls to get a path from the ant on the N wall to the ceiling, then along a side wall to the dot of honey on the S wall. It forms the hypotenuse of a right-triangle with sides 37 ft and 17 ft, so the hypotenuse is sqrt(17*17+37*37) = approx. 40.7 ft.
Its 11 feet down from the ceiling to the honey, so that’s 42 feet. Of course. I read “middle of the wall” for the south wall. Time to learn to read. Or time for me to write more clearly! Actually that is dumb, read the question!!! Forget this. 23 feet – down 11′, across 12′ – honey dripped to floor, hence 23′ to a tasty morsel. (or to complete journey to honeypot – 24′). ant and honey aligned on same plane center of a 12′ wall so life is simple. Sorry if I wasn’t clear but its 30 ft n to s, and there’s a shorter way. The ant travels 40 feet. The general approach is to head up to ceiling and diagonally across the ceiling to a point along the wall, along the diagonal to the floor at a point before the corner, across the floor to the wall, and diagonally across to the honey. x is the distance the ant saves on the 30 foot wall by cutting the corner. So the ant initially heads 1 foot up the wall plus a further 7 feet along while travelling 6 feet towards the edge, travelling along the hypotenuse of a 6×8 foot triangle, for a total of 10 feet. This puts him on the top of the 30 foot long wall 7 feet from the corner. He travels down the 12 of the wall and aims for a spot 7 feet from the corner, so the hypotenuse of a 16×12 triangle,or 20 feet. From this spot on the floor 7 feet from the corner, he heads across the floor and up the wall, travelling along the hypotenuse of a 6×8 foot triangle, for a total of 10 feet. In all, he travels 10 + 20 + 10 feet, for a total of 40 feet. Can you confirm that it’s definitely over 30? Just so we know quite how creative we need to be. Yes, definitely over 30. It doesn’t need any of that type of creativity. Its a math puzzle not a tricky wording puzzle. Ant can also take the way up, so, 1 ft up, 30 ft to the south and 11ft down. Which also = 42. Now, ant is in the middle of the 12ft wall and it’s 12 ft wide right? Because she’s an ant, she can also walk to the side of the wall. So, she walks 6ft left, 30 ft right to reach the south and another 6 ft right to reach the honey. Also equals 42ft. Now, she cal also take the 6ft right path, walk 30 ft south and 6ft left to reach the honey and that also = 42. Now Max, you tell me! Oops, looks like I was wrong. If ant was to use the side road, it would have to do another 10ft, so, the answer would be 6 + 30 + 6 + 10 = 52ft. If it were to use the side road that is! Something I haven’t seen elsewhere: if the room is a cube, the direct route (vertically down, the across the floor and vertically up) is the shortest route. As the length of the room increased to longer than 18 feet, then the diagonal route becomes shorter. ‘Unfold’ the cuboid to reveal its plan. 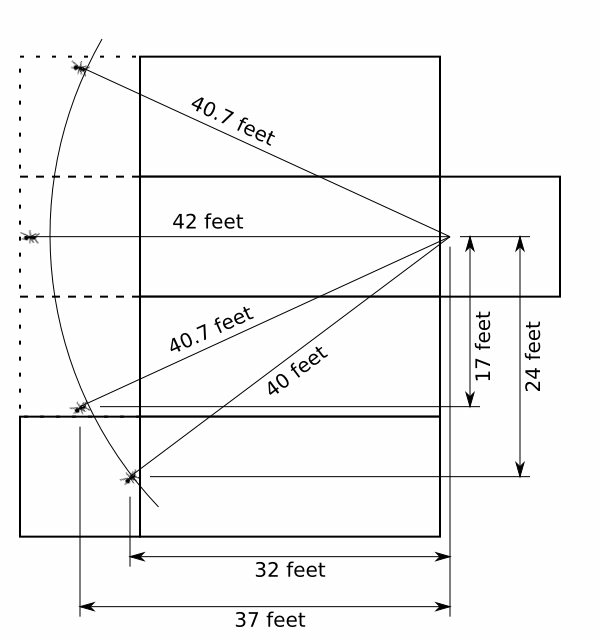 Then the solution is clearly (using pythagorus) sqrt (24×24 + 32×32) = 40 feet. what if to put room down on north side since its cube and all what ant has to do to w8 til honey drops right on him him, not like its glued to the wall, so it gonna move down the wall.